I’m back in Switzerland after facilitating Australia’s first IIHA 3 day hand analysis intensive course earlier this month. Thanks to Patti Barton’s tremendous organizational skills, the course was a great success. We now have 12 hand analysts in Queensland, Victoria and New South Wales that will receive my backing and support as they open their new-found wings and practice their skills to help others find their life purpose and fly through professional hand analysis techniques. I felt deeply honoured to lead such a great class of high powered women from all walks of life. We had a number of counsellors, therapists and healers in the group, as well as graduates, business professionals and artists. Everyone contributed their own unique energy and spirits ran high as a result. What surprised me about this group was the number of seasoned palmists who joined us: Reiki master Jo Hayden from Brisbane, Remedial therapist Patti Barton from Gold Coast, Teacher and counsellor Shivani Killen from Sydney (each with 20 to 30 year’s experience in the world of hands. Also in this category, Hedonna Thurgar from Byron Bay and Ruth Gale from Melbourne. Left to right, me (Jena Griffiths), Patti Barton and Sarah Yip. It warms my heart that so many serious hand readers are now seeking professional hand analysis training. We even had Brisbane’s Psychic palmist Sarah Yip with us albeit only for part of the fingerprint day. It was quite a challenge keeping everyone engaged and on the same page with so many different levels of expertise in the room. In many ways starting from scratch is much easier for students than having to unlearn other systems. Promising new hand analysts to keep an eye on: Jody van Hest, a gifted healer and writer from Burpengary, Joanne Dicinoski a transpersonal art therapist from Brisbane, artists Mrudula Carpenter and Helen Hutton, Sally Young a counsellor and Ann Baker a teacher and healer from Brisbane. Plus all of the above who already have decades of experience exploring other systems. Also with us but not in the photo: Maryanne Parker a talented career coach from Samford. The group was brought and held together through the incredible organizational skills of Patti Barton a gifted artist, remedial massage therapist and academic/sociology PhD who has spent 35 years exploring hands. Patti is the author of Patti’s Palmistry: A Hand Book on Hand Reading. For the last three years Patti has been with us in Earth School learning the IIHA hand analysis approach to hands through my interview series with Richard Unger. A special thanks also to Lionel Fifield of the Relaxation Centre of Queensland for hosting the 3 day event at the centre. I am deeply inspired by Lionel and all he does, including over 40 years of holding a space for so much good work to occur at his remarkable centre. It was such a pleasure to do the course with you Jena. It has taken my palm readings to a much higher level. The recognition from clients about the schools is amazing, as was my own school identity. I fully understand your saying that an hour with Richard was like a years counselling wrapped up in a hour. The insight into our life by looking at the prints is amazing. Thankyou from the bottom of my heart for bringing this wonderful information to Australia. I would love to organise a reading with yourself Jo. I have already learnt so much from you about crystals and energy, and now I need help to have some understanding about my energy, I can feel the universal energy becoming in tune with my own. I don’t know if that makes sense to you but if you can help me in anyway to find my way. As it grows stronger I become more unsettled as I feel I don’t want the family to call me crazy. 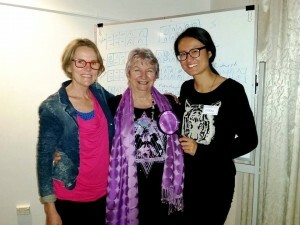 Dear Ruth, thanks for flying all the way from Melbourne to join the class and add your amazing energy and team spirit. I love your professional approach to your studies and the fact you had already covered so much of the material that was given in advance. It is great that there is now a serious student of hands in Victoria. I know you are going to shine brightly as a hand analyst and the gifted healer you already are. What an amazing 3days we spent with you. The information you shared with us and your superb teaching skills. It was truly transformal for me. I experienced many enlightened moments and realised all the things I have studied over the last 30 years are all related so I can move forward to transform many lives for the better with Hand Analysis. From the depths of my heart I send you my humble thanks, Jena. Meeting and getting to know all the other lovely ladies was the icing on my cake. It all made for a splendid long weekend. Patti, what a job well done by you. Without you magnificent organisational skills the Intensive 3 days would not have been the success it was. Thank you again Jena, Patti and Thank you to everyone else. You have all been etched in my heart forever. Thanks for being with us and adding your unique energy, enthusiasm, curiosity and inquiry skills to the class. You have all the makings of becoming a great hand analyst. Looking forward to watching you grow your skills and shine.